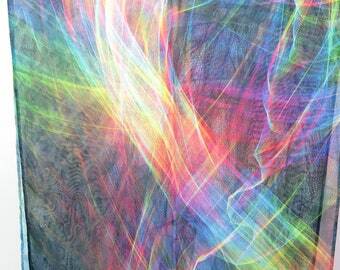 Mathematics Made Beautiful. 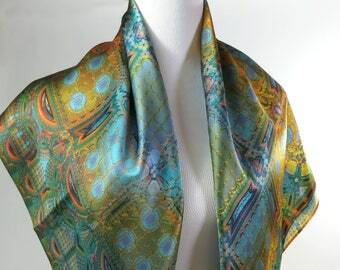 Fine silk scarves & shawls. 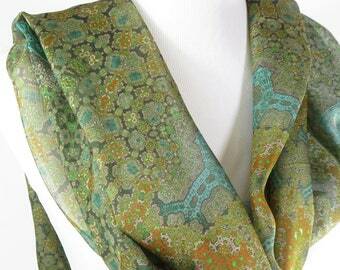 Long Silk Scarf Shawl, Meditation Shawl, Unique Scarves for Women, Sage Green Silk wrap scarf, Mother's Day gift Ideas, "Orient"
Announcement Meet me in Ann Arbor at Teaspressa, April 26, 6-8pm for a scarf sale and book signing event. Lauren Friedman, author of the "50 Ways to Wear" series will be there, and between us, we have solved Mother's Day gift-giving for you. You're welcome! What's new? New Meditation shawl colors, lots of new pocket squares and small scarves, and soon-to-come double sided festival scarves. And lots more coming by mid-April! Check the "For Him" section to see many new Pocket Square designs! Browsing on a phone? Click Sections just below the Search box, and select "For Him". 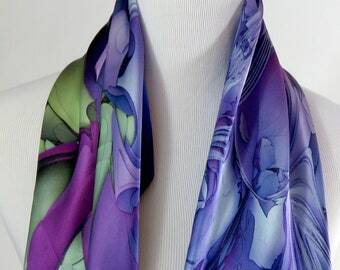 My 3D-Fractal and Procedural-designed scarves are made from the finest fabrics like silk satin and silk chiffon. 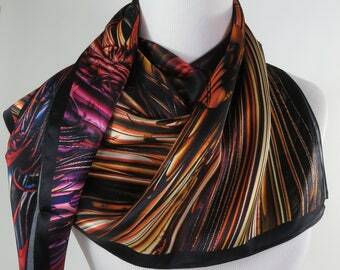 My scarves and accessories make unusual and thoughtful gifts. Seen up close, they are filled with amazing detail and are very beautiful. All items arrive elegantly gift-boxed. I'm working on new items all the time, many of which are in the "Made to Order" section. Feel free to ask about anything you see there, for more photos of any item, or about wholesale orders. 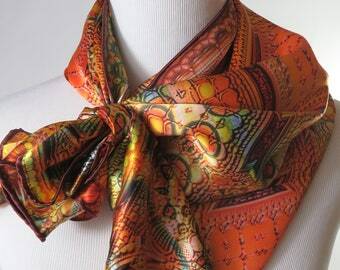 Meet me in Ann Arbor at Teaspressa, April 26, 6-8pm for a scarf sale and book signing event. Lauren Friedman, author of the "50 Ways to Wear" series will be there, and between us, we have solved Mother's Day gift-giving for you. You're welcome! 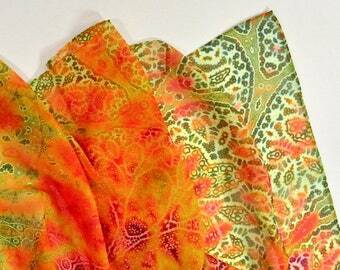 Festival Scarves for Men, 2-sided Silk Fractal scarf, festival clothing, Long Satin Psychedelic Scarf Red Gold Brown, "Fractal Patchwork"
Festival Scarves for Men, Fractal scarf, festival clothing, Double-sided Long Poly-Satin Scarf Red Gold Brown, "Fractal Patchwork"
So beautifully made! An impressive and unique pocket square! Shipped on time. The scarf is beautiful. Such vivid colors. Bought it for a friend's birthday and I know she will love it. New Designs just in! 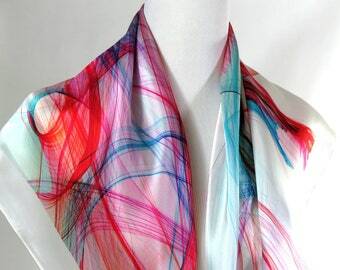 Try this gorgeous 36” white silk satin scarf with red pink and blue brush strokes. For the scientist in your life. 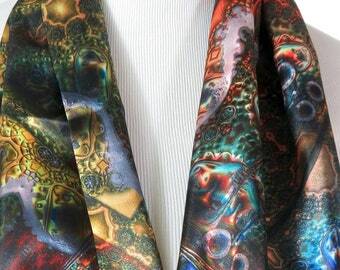 My Fractal Microbiology Pocket Square/Small Scarf looks like Electron microscope imagery, but is all 3D Fractals. 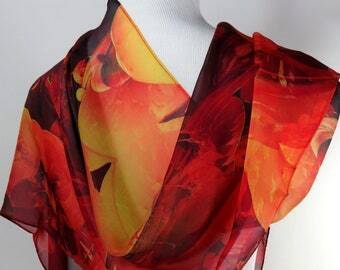 Red Summer Scarf for women, Long Silk Chiffon Scarf, 3D Fractal Design, red and yellow summer scarf, "Fire of the Heart"
Your purchase will arrive in an elegant gift box. 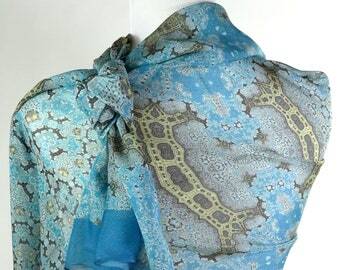 Sheer chiffon and luxurious satin scarves with unique designs. My imagery is based on fractals and procedural art. 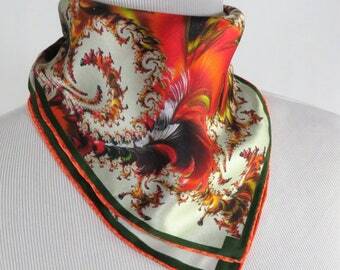 Not just for women: my line of Men's accessories is growing, with silk ties, cravats, and pocketsquares. Some of my customers get very creative, using the scarves as wall decor or framed artwork. My trunk show at the UMMA museum gift store was wonderful, and a chance to meet my customers in person! 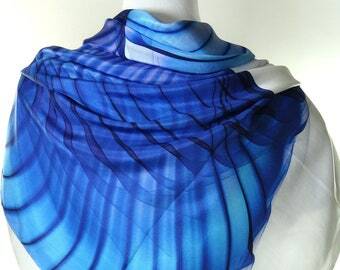 Wearable Mathematical Art by Ellen Meiselman. 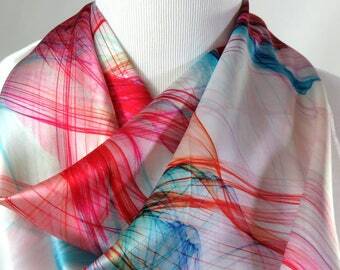 I really love seeing my digital, algorithmically generated designs come to life on silk. The folding and translucent quality of the silk adds a random element that creates an infinite variety from each design. My images are created through experimentation with fractals or procedural tools. I tend to focus on very organic or natural shapes. 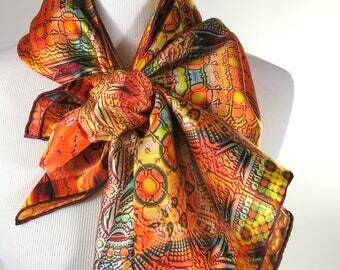 New designs will be showing up frequently, so check back often as I grow my library of scarves. 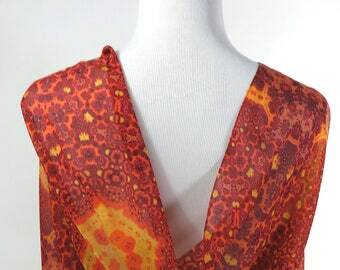 I work closely with my printer who maintains excellent standards and matches my colors precisely, even on chiffon. I use a very high quality Chinese silk. It feels wonderful, and drapes beautifully. I have always been fascinated with tiling and symmetry as well as the mathematics of modeling organic forms in nature, pursuing these interests initially through traditional media, but have increasingly turned to digital and generative art. 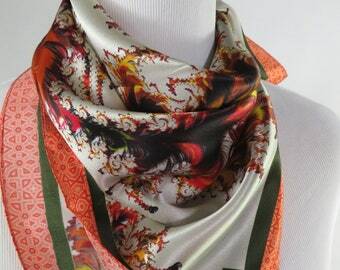 My scarves are printed by a small digital fabric printing company in China who excel at color matching and use high quality materials and environmentally safe inks. They work closely with me on each project. This printing service specializes in helping artists around the world share their work with everyone in a printed form. The quality of their Giclée printing is exceptional. An American online marketplace that allows designers and customers to create their own products with independent manufacturers. Find ScarvesByEllen at the following upcoming market! Your Mother’s Day shopping is secured! A copy, or the whole set, of Lauren Friedman's "50 Ways to Wear" book series is the perfect gift for all the important mother figures in your life, particularly when paired with a luxurious scarf. Join Lauren and Ellen Meiselman of Scarves by Ellen at Teaspressa in Ann Arbor, Michigan, on Friday, April 26th from 6 - 8pm for a book signing of 50 Ways to Wear a Scarf, 50 Ways to Wear Denim, and 50 Ways to Wear Accessories, and shop a gorgeous selection of silk scarves. Welcome! If you are looking for a strikingly different gift, this is the place! 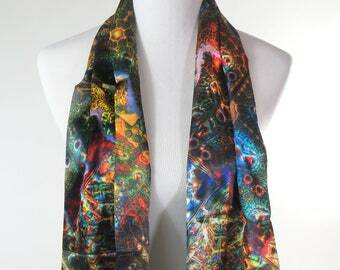 All my scarves are digitally printed from my original designs. If you have any questions about an item, feel free to convo me. Return shipping cost is the buyer's responsibility. If for any reason you wish to return an item, contact me within 14 days after receipt of the goods. Then ship the item back to me to arrive within 30 days of receipt. Shipping it back need not be expensive because you do not have to include the gift box. Simply seal the item in a clean plastic bag, and put the bag in a padded envelope - you can reuse the one it was shipped to you in. Send it back to me, preferably with tracking. Send me the tracking number once you have sent it back. You will receive a refund for the full price of the item as soon as it makes its way back to me in original condition. I do not refund shipping costs, as those are out-of-pocket costs for me. Please, make the payment directly after ordering. Items will be shipped after your payment has cleared. Please note: all state of Michigan residents must pay a 6% sales tax. All domestic U.S.A. orders are shipped via USPS First Class or Priority. Check the item listing Shipping Tab for time to ship. All shipments are insured. you will NOT have to pay the same shipping on each item going to the same address. I will immediately refund any overage in shipping costs. Convo me if you have any questions about shipping! There are times when I may list 1-2 weeks because I am very busy but your item may actually take much less time to ship. If you really want something right away, convo me before ordering and ask if it is possible. Most of the time I can ship within 1-3 days. However, items marked "Made to Order" and Custom Orders cannot be rushed beyond about 8 weeks, and delivery on a certain date cannot be guaranteed. Convo me with questions about made to order items. Wholesale: Convo me for access to my wholesale linesheet. 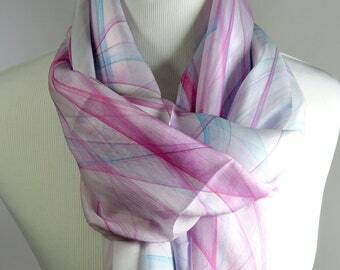 Custom Orders: I do some custom scarves. I cannot print your designs or third-party designs because of copyright issues. Wholesale: Convo me with inquiries.